When analyzing a situation or a problem, should you draw a decision tree or should you map out an influence diagram? If you have decision tree software, you may (for reasons of availability) be swayed in the direction of the decision tree. It gives you immediate information on choices, consequences and possible outcomes. However, the decision tree rapidly becomes a victim of its own success in this sense. As the number of options and factors rise, the complexity of a decision tree rises too, but disproportionately. On the other hand Analytica uses influence diagrams as a starting point. What then can you do with Analytica to accommodate decision trees? 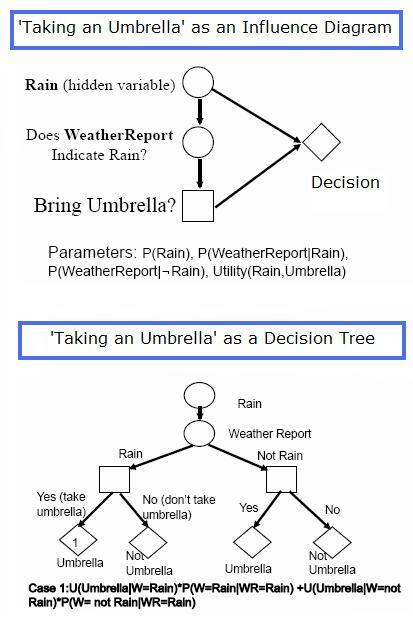 Decision trees and influence diagrams are two different solutions to the same problem, that of modeling a decision. Both have their merits, as the existence of decision tree software shows; some products go as far as building in Monte Carlo simulations. Analytica is not decision tree software as such, because it assumes needs for handling complex situations and for retaining clarity in expressing concepts and models. This is what prompts the choice of influence diagrams as a starting point, with the additional advantage of being able nest influence diagrams and easily navigate between an overall model (top-level influence diagram) and sub-models (nested influence diagrams). Both solutions use similar shapes in their constructions. They both use squares to show decisions to be made and circles (or ovals in Analytica) to show chance events or variables. Branches from a square indicate possible actions; branches from a circle show possible outcomes with probabilities or probability distributions assigned to each outcome. Each path through the decision tree or through the influence diagram leads to a payoff for that path. In a decision tree and in decision tree software, each payoff is shown individually at the end of each particular path, whereas in an influence diagram payoffs are grouped in a single objective node. Given the similarities above, it becomes clear that at least to some degree decision trees and influence diagrams are interchangeable. Although it would in principle be possible to manually draw out a decision tree in Analytica with labels at each node to show how the paths progress, it makes more sense to use the power of influence diagrams. Not only are these integrated into Analytica anyway, but as we mentioned above they also rapidly become the solution of choice for modeling complex decisions and (an important factor) for explaining decision models to a non-expert audience. Those who would like more time to make the transition may carry on using decision tree software. However, like modeling with spreadsheets, initial facility may not be enough to compensate for difficulties that arise as models become more complex and input factors multiply. If you’d like to know how Analytica, the modeling software from Lumina, can help you make influence diagrams that then turn into meaningful simulations, try a thirty day free evaluation of Analytica to see what it can do for you.